CRELender provides commercial real estate financing for borrowers, realtors, and mortgage brokers nationwide. Our team will analyze capital lending sources in real time, to offer you the lowest interest rates available today. CRELender compares over 38,000,000 individually closed title records to guide loan applications by matching incoming requests with similar past closed loans, from our capital sources directory. 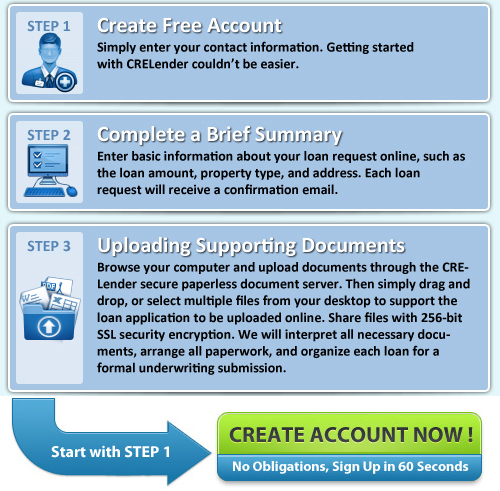 Through e-processing with CRELender.com, each loan application will be summarized, then organized for a formal underwriting submission designed for fast loan pre-approval. "I don't know what I would do without CRELender.com. They took a loan with very difficult circumstances, and not only were they able to work through the complications, but it moved forward quickly into closing." "If you need a loan service with a commitment to getting your loan closed successfully and efficiently, CRELender.com is second to none. I wouldn't trust anyone else with my financing needs!" "Building strong professional relationships is critical for a growing business. When I wanted to expand on my hotel, I sought out a loan service that had a strong reputation. Now, after working with CRELender.com, I can see why they are held to such high reputation! I am now comfortable and confident that my hotel will continue to grow along with CRELender.com!" "The assistance CRELender.com has provided us has been extraordinarily helpful! Not only were they successful in getting yet another office building to closing, but they also provided us with a well-organized file of the documents that will effectively be used for future financing needs." "The most important thing for me when dealing with a lender is the trust. With CRELender.com, this was never once a concern. They are professional from start to finish, all the while keeping my unremitting confidence in their integrity." "Sincere thanks for the extraordinary service! Your personal support, care, and reassurance, along with your professional advice and effort working on our transactions have made yours a valuable business relationship." "CRELender.com is very attentive and truthfully knowledgeable on what's working and what's not. It is such a pleasure to do business with a company like this. I don't receive personal service like theirs elsewhere, even in my hometown. Thank-you so much." "The team of loan officers at CRELender.com is extremely willing to share their knowledge and they come through with some terrific advice. I have no idea how else I could have gotten this deal closed in time. I am really thankful they were involved." "Very honest, professional, friendly people to work with. Another project finished on time, and I was completely satisfied." Our company saves a small fortune on postage and document wiring fees by working with CRELender. Any time a file is needed, I just uploaded it-simple as that. CRELender is the quickest and easiest way to send and receive the dozens of files, back and forth between all the different parties involved with each loan process." "When I have trouble placing a new loan on my own, I turn to CRELender.com. They combine cutting-edge technology with well-established relationships to close loans efficiently time after time." "The knowledgeable staff at CRELender.com is able to guide me through the treacherous loan process by keeping me updated with checklists all along the way." "My colleagues and I frequently work with CRELender.com. They are easy to work with, motivating, and experienced in closing loans." "It is with sincere gratitude I recommend CRELender.com for your financing needs. They continue to generate results, supporting our competitive rates and programs we offer." "CRELenders comprehensive platform is a great way to share files while cutting costs on shipping and cutting time on file upload and download. Their processing team members are genuine, intelligent people to work with, and it has even made some of my agents jobs easier. Thank you for personally handling our difficult sale. Your attention to detail made everything go smoothly." "CRELender.com has become an extension of us. It's part of our system and how we communicate and work together. Overall, we're saving thousands ever year, if not more, because we no longer have to make photocopies and mail out materials." "The processor who handled our loan was focused on the details and understood long range planning. Our last major project with the Bellingham Company was a great success due to CRELender.coms' exceptional attention to detail and honesty. I highly recommend them." "Work completed on time and exceeded my expectations. We'll use your services again and be happy to refer you to others." "CRELender has been a huge part of our success. Working with them has given us the opportunity to grow. Professional, quick response and quality work. All you need in a great business, and CRELender provides it." "CRELender.com really goes the extra mile to make sure we are always on the same page and always progressing forward. The communication we continue to exchange is an integral part of the success we share." "My business associates and I have a strong appreciation for CRELender.coms' fortitude in supporting a client's circumstances and needs." "I am confident with each client I bring to CRELender.com, that everything will be dealt with in a professional manner. They ask correct, relevant questions and always provide an answer on the deal in an expeditious manner. A recent transaction that was dragging on for several months at another lender was closed and funded within 20 days." "The transaction was so easy and efficient. I was impressed by just how neat and professional all of the presentations I received were, and it seemed as if I had their full focus. I felt completely comfortable signing the broker agreement, because I had spoken with their loan officer several times throughout the process." "Everything went through on this end today without a hitch. Thank you very much for the fast and professional service. It was a pleasure doing business with you. If I have another note to sell, you will be the first person I contact." "Being fully web-based is amazing. Everything is there, and it's always available. I honestly do a lot more work from home, or out for mid-day coffee. CRELender has taken a tremendous amount of work off my normal routine." "Their team is very professional and they get the work done fast. They are easily reachable and reply to email and calls quickly. I am continuing to use their services and highly recommend them to anyone!" "I joined after I saw some advertising for CRELender.com on several multiple-listings sites. Taking the safe side, I called their number first, and was promptly connected with one of their very friendly staff members :) The purchase was quickly advanced and closed on time." "I've been an agent for 20 years, and I love being knowledgeable to my clients. I use CRELender.com because they make looking professional seem effortless for me. Having their service and advice right on hand adds experience to my services without the extra years." "Your purchase plan was quick, easy and completely solved my problem. I actually enjoyed running this deal and landed a new account, which I would not have had otherwise." "From the professionalism of the marketing representative, to the concise and organized documents I received on the client, CRELender.com was able to make the loan process as efficient as possible." "I was very impressed by the systematic arrangement in which the client's material was laid out for me. It allowed our bank to close on the loan quickly and easily." "Thank you CRELender.com, for bringing such well-prepared loan inquiries to our bank time after time. I value our ongoing relationship quite fondly." "truly feel that CRELender.com is a leader in this industry. Their system of organizing the client's documentation is cutting-edge and makes the entire process incredibly efficient." "The relationship our bank has developed with CRELender is one of our greatest assets. They continue to make our company more efficient and successful with each loan from them we are able to close." "The professionalism demonstrated by CRELender.com continues to instill my confidence in them. It is always a pleasure to work with the Bank Relations department to get the job done." "With continuing market challenges, a great deal of paperwork is often necessary to close a loan. By working alongside CRELender.com, all of our documentation needs are taken care of, without having to waste any time on our part." "Working collaboratively with CRELender.com on closing loans has proven to be an advantageous business decision. We continue looking to them to bring us new, well-organized, make-sense loan packages. The completeness of their commercial loan packages is impressive and motivating." "Every time I get a call from CRELender.com about a new loan, I know it's good news. They only call me with deals within my strike zone, delivering me practical, easy-to-close loan packages every time." "From the time we worked together on our first new loan, I knew we needed to develop a lasting professional relationship. Time after time, CRELender.com provides me with loan package opportunities that are well-organized, correctly-labeled, and easy to understand. I look forward to closing many more loans with CRELender.com."